In the Christmas season of 1913, Grace Knight's elegant old hotel on Cuernavaca's main plaza is the place to see and be seen. Mexico's landed aristocracy, members of the foreign community, wealthy tourists, and young army officers with their wives flock to the Colonial. Under the ballroom's hundreds of twinkling electric lights, they dance to old Spanish tunes and to the new beat of ragtime. Outside the city, in the shadows of the valley's two volcanoes, a company of federal soldiers raids the hacienda of Don Miguel Sanche, hunting for men sympathetic to the cause of the charismatic rebel leader, Emiliano Zapata. In a hailstorm of rifle fire, sixteen-year-old Angela Sanchez's life takes a horrifying turn. After the soldiers leave, she returns to the ruins of her family's home. She collects her father's old Winchester carbine, gathers the survivors among his workers, and rides off in search of Zapata's Liberating Army of the South. 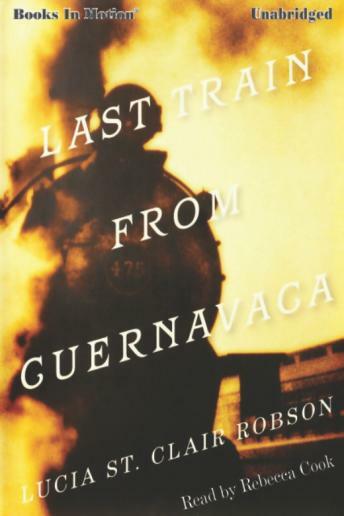 Last Train from Cuernavaca is the story of two strong and ambitious women. For the sake of love, honor, and survival, they become swept up in a Revolution that almost destroys them and their country.